#1 - Does the Reaper Dream of Darkness Darker Than Black? After meeting with Amber, Hei learns that against common knowledge Contractors can become more humane than was thought to be possible. Realising his own position between the world of contractors and humans, Hei has to make the decisive choice for both. With final farewells to his past comrades inside the Gate, and their support behind his back, Hei's decision brings new future for the world. Hei's team, on the orders of Eric Nishijima, has been kicked out of the syndicate and contracts taken on all their lives. 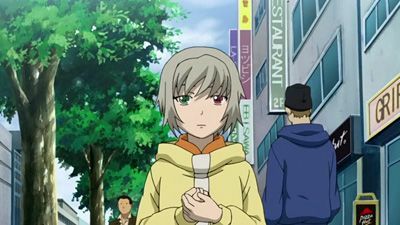 Misaki discovers that the "syndicate" is really a collaboration between intelligence agencies of multiple countries and that she herself has been an unknowing member. Hei, Yin, and Mao infilitrate Hell's Gate while Huang detonates a suicide bomb for distraction. Mao is disconnected from the Syndicate's network and his feral cat behavior takes over and runs away. The EPR's contractors attack the gate, leaving the focus open for Hei and Yin. The syndicate takes out the EPR's doll system, leaving Hei with only Yin for guidance as they head towards the conclusion of the story. Eric Nishijima is using a particle accelerator to wipe out the contractors. Amber gathers numerous contractors to destroy the accelerator, and dolls to be used for some other unknown reason. 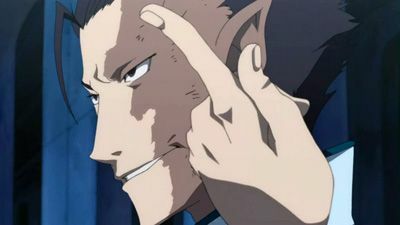 Nijishima is related to the Syndicate as he places a phone call to eliminate Hei and his team. Amber sends a message to Hei via Wei, telling him to meet her in the Gate. Hei agrees and thus Huang, Mao, and Yin, agree to assist Hei to infiltrate Hell's Gate with Wei's guidance. When Suou finds Shion collapsed, Shion explains that it’s because he paid a suitable remuneration. 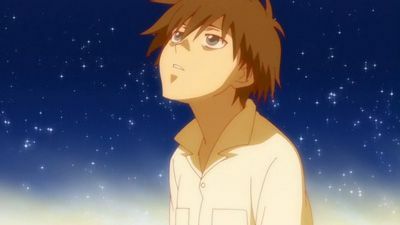 He then asks her to take him outside because he wants to see the moon, and by the time Misaki and company arrive, the two are gone. Hei meanwhile finds himself locked in battle with Hazuki Mina, and she’s eventually able to tie him up. 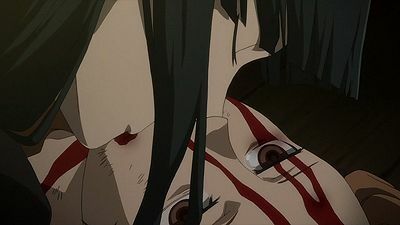 After kissing him as part of her remuneration, she prepares to kill him, but Kobayashi steps in and reveals that it wasn’t Hei who killed Youko. The real culprit was Shizume Genma who had betrayed them for the CIA, and the Americans have taken over control of most of the organizations inside and outside Japan. Given all this, Mina has Kobayashi and Hei go on ahead while she goes to take care of Genma, and Kobayashi takes Hei to where Yin’s body is. The body, however, is now only an empty shell, and Yin’s awakened spirit has gone to the center of the Gate. By now, Madame Oreille has brought Misaki and Mao to a building that houses a super-computer created by Dr. Pavlichenko. 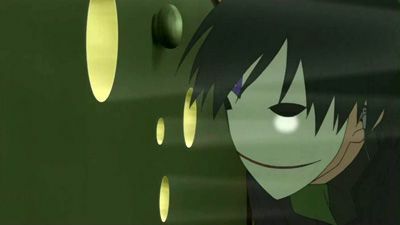 In it are rows of bodies that look like Shion, and Madame Oreille explains that the super-computer has all records of the world as observed by the Doll Network and all memories of mankind gathered by the ME Network. It was all for Shion’s plan, and Madame Oreille reveals that the moon isn’t really a moon - it’s another Earth created by Shion’s ability. At this moment, unaware of all this, Suou is pushing Shion in his wheelchair somewhere inside the Gate. In talking about Suou’s memories, Shion reveals that he only imagined human-like memories and put them in her and that his dream isn’t a reflection of those memories. He also notes Suou’s sentimentality despite being a Contractor, and Suou attributes it to the influence of the people she traveled with. The two then come across the dead body of a Contractor, and Shion disappears in that instant. Suou searches inside the Gate for Shion until she comes across one of July’s observer spirits. While she’s following it to him, July is being found by August 7 who tells him that their operation is over. July, however, refuses to go with August 7 and chooses instead to stay with Suou, so August 7 lets him go and disappears. Suou arrives just moments later, and after hugging her, July leads her to Shion and Yin. Suou finds Shion almost dead, and in his final words, he tells her that the deal is done and that he wants her to see the world he created. His spirit then goes to Yin, who is floating above them, and Yin tells Suou that she granted Shion’s wish. At this point, July collapses as well, and, still not really understanding what’s going on, Suou decides to bring out her gun against Yin. This leads to Yin breaking the meteor core on the necklace that Shion is wearing. As Madame Oreille explains to Misaki and Mao, when they copy a person and implant memories, they can’t establish it for long without the meteor core. They thus used Suou and her journey here as an experiment to make sure that Suou’s memories had set. What this means for Suou now that the meteor core is destroyed is that her memories are leaving her. Realizing what’s happening, Suou tries to resist the loss of memories and aims her gun at Yin again in a last ditch effort, however Hei shows up and stops her from shooting. As he holds her, he tells her that she won’t be needing her gun where she’s going next, and he promises that he’ll always be with her. He lays her down beside July after she loses consciousness, and Yin then tells Hei that it’s not too late to kill her. By the time Misaki arrives on the scene, she sees BK-201’s star lighting up in the sky, and a bright light envelops Yin as she’s touched by Hei. In the aftermath, Suou lives a normal life with both her parents on the copied Earth. She can sense that something is lacking, and though she’s not lonely, she feels that she knows a certain someone very well and believes that she’ll meet this person someday. 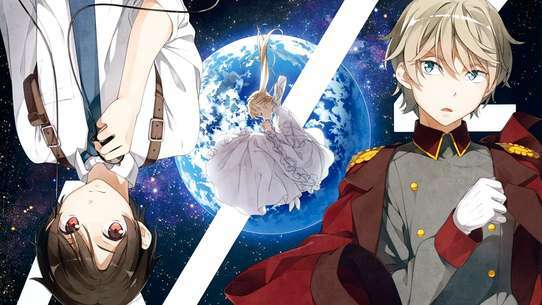 Back on the real Earth, Kobayashi thinks that it’s all over, but Misaki feels that things are just beginning, and Madame Oreille picks them both up. They then leave the Gate and start operating independently since America and other countries now control Tokyo, and ironically, they become known as the Syndicate. What they don’t know is what the prophesied newly born thing is and how it will change the world. Unbeknownst to them, a boy resembling Yin wakes up inside the Gate and absorbs the spirits of John Smith and his men. Regardless, Misaki notes that she hasn't heard of Hei again, but she continues to believe that he’s still alive. Hei decides to leave for awhile to settle his own problems. After which, Suō decides to do the same - going to find her father and ask him about her. Suō, July and Mao go to the aquarium and they find Dr. Pavlichenko there. He tells Suō the truth about the meteor incident that year and about Shion's abilities to copy. On the other hand, MIAC head for the aquarium and Genma bumps into Suō and gang. Misaki bumps into Madam Orelle and she tells her to follow because there will be a bloodbath soon. Suō and gang run and hide, but Dr. Pavlichenko is shot by a contractor while trying to protect Suō. They hide somewhere while Genma calls for Suō. Suō tells the rest to hide while she confronts Genma herself. She manages to knock out Genma in the battle, but gets back to the rest only to find her father dying. They leave while MIAC finds Dr. Pavlichenko's body, with Suō's origami of a star on him. Meanwhile, Hei tries to find Yin, but was surprised to see the containment empty. Mina comes out and attacks Hei. Back at the Gate, Misaki meets with Mao and July, only to have found Suō disappeared. 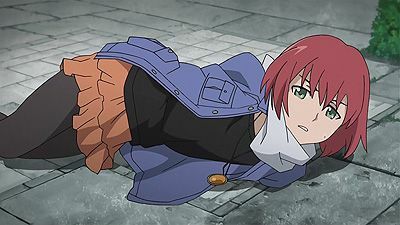 It is shown that she found Shion on the floor, unconscious. Hei and the others landed in Sapporo, taking refuge in an uninhabited part of the city as half of it was previously flooded. Misaki was recruited into the MIAC's black ops division Section 35 and was given the alias of Yayoi Ichinose. Hoping to learn what happened to Hei, she sought out an informant to obtain information of what happened to him. Hei decides to train Suou given that she has obtained Contractor powers after the previous gunfight against FSB forces in Vladivostok. Despite Suou's hatred to Hei for changing her life, she decides to stay with him alongside July. Meanwhile, Misaki heads to the now abandoned National Observatory when she was confronted alone by Madam Orielle, who knows of her real name aside from her alias. Hei is sent to infiltrate a religious organization and kill the Prophet, Alma. He is aided by an insider, another Contractor by the name of Shihoko whom Huang appears to know. Amagiri and Alma appear to be in cahoots with Alma providing him with dolls. A well-meant mistake on Huang's part leads to Shihoko's capture. 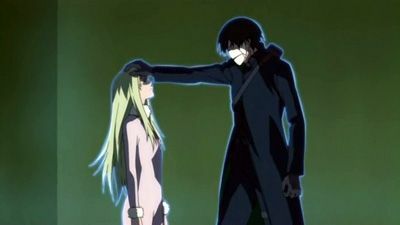 Before Hei could obtain the Meteor Core from Suou, Hazuki attacks him in order to secure Suou. Suou sought sanctuary alongside Nika to avoid being captured by FSB agents due to the events regarding Tanya's Contractor powers being known and for Suou being mistaken for Shion. 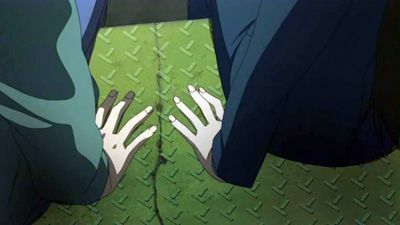 When Hei tries to recapture Suou, he tries to obtain the Fragment when he realizes that "Shion" is actually Suou, which greatly changes Hei's mind of securing her when a FSB squad ambushes Hei. Hei escapes with Suou along when August 7 and Genma attack the FSB squad separately to secure Suou for their own objectives. Hei and Suou were caught in a trap after Hei seemingly kills August 7 by electrocuting the British contractor. 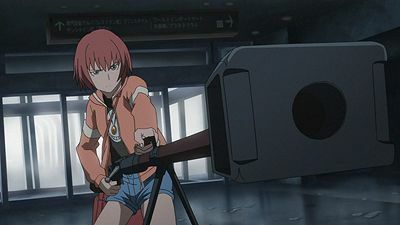 Later on, Misaki is shown looking through a telescope which is directed towards BK201's star. The star fades away. 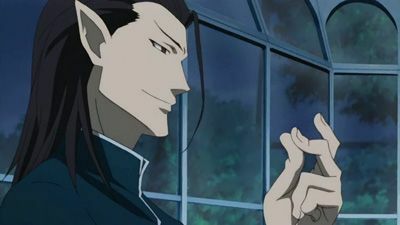 The Organization orders Huang to kill Shihoko, and as a secondary directive secretly orders Mao and Hei to kill them and Alma if Huang fails. 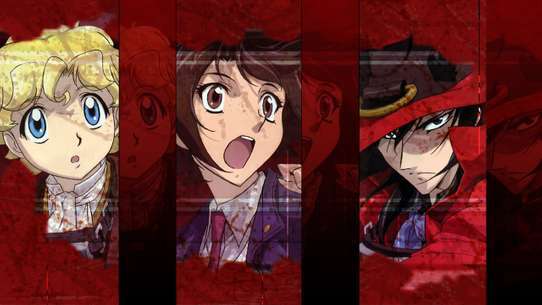 In Huang's past we see him falling for Shihoko, and then Shihoko killing his then police partner Isozaki. Isozaki's wife's memory is wiped by the ME, and Huang is drafted into the Syndicate. He is unable to kill Shihoko, and asks Hei to kill them both. Hei tries to help them run away while Mao refuses to have any involvement. When they arrive at the docks to wait for a boat, Shihoko sees someone from the Syndicate and realizes they cannot escape. For love of Huang she runs into the path of an oncoming truck and dies. Kenji falls for the doll, and they try to run away together with Hei's help. While out shopping, Hei is nearly identified by Kirihara Misaki as BK201, but Misaki doesn't see the relation between Li Shunsheng and BK201. Later, Kenji is caught and nearly killed by the boss, his brother, when Hei saves him. Kenji and the doll successfully run away. Kastenin, Gai, and Kiko take Yin back to her home town, meanwhile Hei is given the order to kill Yin and is given her location. Getting to Yin is not going to be that easy since th contractors from before are still after Yin and have their own method to finding her. The race is on once more, but this time Hei must make the choice on whether or not to kill Yin. Will he kill her or will the option be taken from him? Suō tries to remind her mother of the happy time they visited the aquarium, but flees when she denies it. Misaki finds Suō in the cold and explains that the aquarium she remembers was demolished 13 years ago. 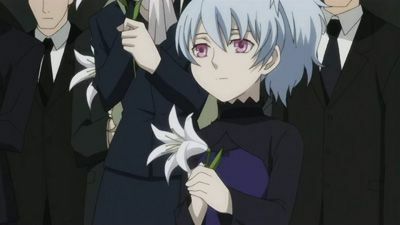 Suō's mother recounts to Misaki that day 8 years ago in Moscow when she took Suō and Shion to see her husband Dr. Pavlichenko at the university; Mao was also present then and lost his body in the explosion. 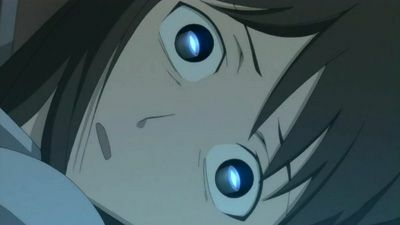 Suō's mother remembers seeing her husband manipulating Suō in a machine, then fleeing with Suō's lifeless body while Shion watched from a window. 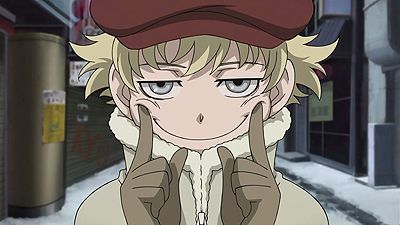 Shion reveals his ability: He can create a perfect clone of any organism. Hei rejoins Suō, July, and Mao after incapacitating Misaki. Mina vows to kill Hei upon finding Yoko's bloody corpse. 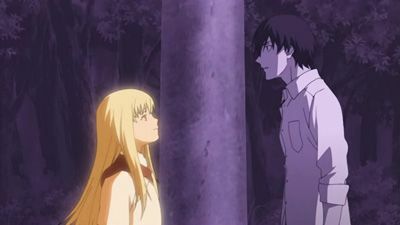 After Hei and Misaki barely escape from Alice, Hei goes his separate way after Misaki and Saitou find each other. After Hei steals the crystal hidden within the stone flower garden, he runs into Wei and loses the crystal in the process. Wei finally meets up with Misaki and Saitou, who have found Alice. 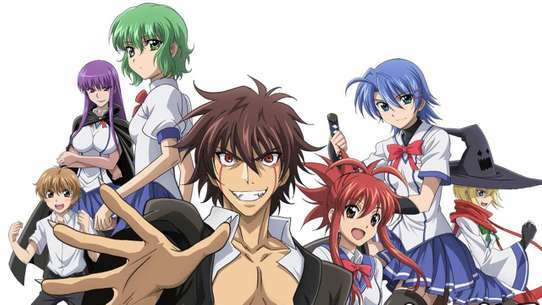 After Wei kills his partner, Alice, he moves in on Misaki and Hei. Mao is taken by Amber to the headquarters of the EPR. While there, Amber calls a meeting for all of the EPR's contractors, including Mao, and the Doctor. She reveals that there was a plan to destroy the South American gate, which would have led to the eventual disappearance of all world-wide contractors. The Doctor notes that the plan was interrupted by a mysterious blue light. November 11 meets the head of East Asian MI6 operations, who is revealed to be a member of the Syndicate, and they kill each other. Hei attacks the EPR to rescue Mao. Hei uses his powers on Amber while Amber activates her meteor shard, resulting in the illumination of the whole building in a blue light. Hei was attacked by a group of MIAC agents led by Michiru, the wife of a local restaurant owner who left him three years ago after being a Contractor for the MIAC. Suou and July were able to escape capture from the agents under Hei's instructions. Misaki is tasked by the MIAC to lead a Section 3 unit in delivering a device with the codename as Izanami under orders from Kobayashi. Hei recruits Suou to assist him in launching a raid on the Section 3 convoy under orders from his employers to seize Izanami with the mission seemingly a success after the truck drives away in the attack. Michiru appears to her family in Sapporo, startling her ex-husband and son. Suou watches the waters of Sapporo after the mission, seeing an unknown submarine covertly entering Japanese territorial waters. The trap devices holding Hei explodes from the energies caused by the meteor fragment. Suou goes into a daze and shove both herself and Hei into the sea. Hei awakens in a hut with Suou in tow. After a tense exchange, Hei decides to bring Suou and leave Vladivostok. Hei and Suou try to make their escape at the train station while Nika distracts Tania from her mission. Misaki is questioned by an MIAC official named Kobayashi about the contractors and the Syndicate. She is given an offer to join MIAC in pursuing BK201 who is revealed by Kobayashi to be alive. Hei, Mao, Suou and July, who has joined up with them, rides on a ship leaving Russia. As Suō and July ride a train through Tokyo Suō collapses from a high fever, waking up in Kiko's bedroom. Kiko and Gai decide to help Suō search Tokyo for Suō's mother, but with little success. Misaki finds a recording by Amber which instructs her to find a certain CD, which informs her that Izanami will eventually meet Izanagi, at which point Hell's Gate will open. Following the advice of Madame Orielle, Suō proceeds to an airport to find her mother. At the airport Hei appears and kidnaps one of Misaki's teammates, easily evading Mina and escaping. 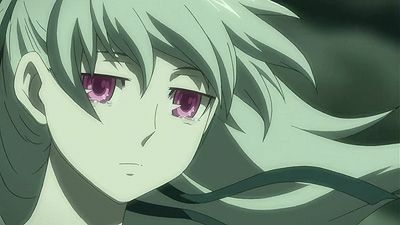 Suō's mother cries upon meeting Suō in the airport, believing she is her twin brother Shion. 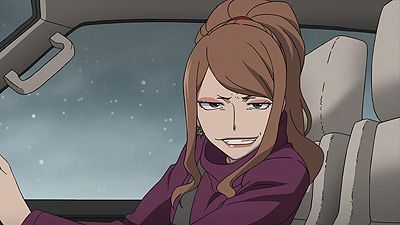 In a car Suō tries to explain that she is not Shion, but her mother dismisses this saying that Suō died 8 years ago. Havoc is iterrogated by Hei on the whereabouts of Amber and Pai (Who is Hei's younger sister) Unfortunately, Havoc does not know anything useful. She offers to help Hei by approaching the Gate and recovering her memories and powers, but that only leads her to wanting her own death. With the MI6 agents in pursuit, her wish may be granted. The Stargazer of the Astronomical Bureau finally speaks, giving vague information on the Evening Primrose. November 11 kills Maki in a final showdown as Hei finally reaches Amber, who has taken Yin. Misaki also arrives at their location, but, with the help of Amber's contract, everyone escapes. A doctor is abducted by agents of the EPR, while the American embassy in Tokyo suffers attack from Hei and his team. A new contractor with the power to teleport herself and others appears as a double agent for the EPR. Wei Zhi Jung reappears, but is scarred from his last encounter with Hei. Misaki enters the embassy compound only to be detained by PANDORA, and Mao is discovered by Amber. November 11 leaves the M16 for the EPR. 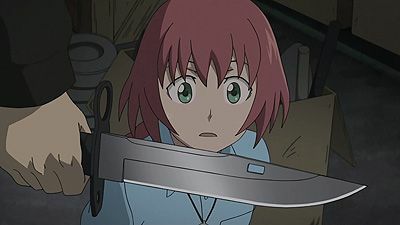 Hei engages Genma in a battle, taking in the trap prepared by Misaki while she and the rest of Section 3 prepare to transport Izanami to the Greater Tokyo Area via submarine. Suō and July are tasked by Mao to take down the metal container that houses Izanami. Hei, after realizing that Yin was in the container all along, interrupts Suō's attempt to shoot it and instead retreats. Hei and the others retreat from Sapporo also, heading to Tokyo after Suō witnesses the death of Michiru when a specter resembling Yin strangles her with her water powers. 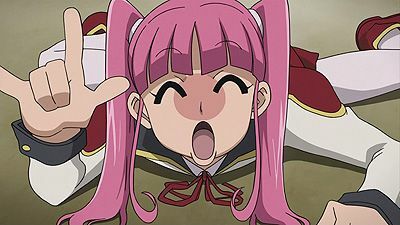 Misaki is later warned not to think of Yōko as an ally. Hei then goes rogue once more, cutting off connections with Madam Orielle. When Suō sees Yin's specter from the electric pole, she kicks it before walking with Hei back to their hideout. Suō recalls a summer day in Vladivostok before the series when she played with Tanya by a pool. Meanwhile, Hei is intercepted by Repnin's men in the train hallway and Suō is confronted by Tanya. Repnin offers Hei a job with the FSB after inviting him to eat. During this time, Hei and Misaki are told simultaneously that Izanami has the ability to cause contractors to commit suicide. 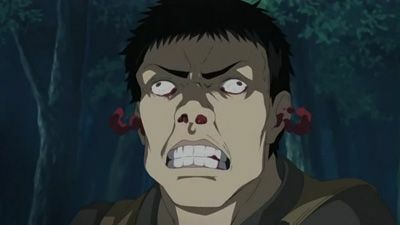 Hei refuses Repnin's offer and attacks him, while Tanya summons a swarm of insects to stop the train and escape with Suō. Outside the train, Hei and Suō face off against the FSB force on their own, defeating them. 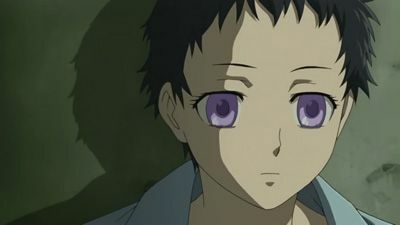 Unknown to Suō, Tanya was killed by Suō's brother Shion from a nearby rooftop. As Tanya floats in the stagnant pool, Suō ponders that she can never return to the innocent summer days she remembers. Suō later heads off to Tokyo with Mao and July on their own without Hei to guide them. A sunspot called the Great Dark Spot, that makes the sun look like an eye, is about to appear and the last time it appeared the gate in South America dissappeared. To make everything even more hectic a boy is going around setting off explosions in the city. But things continue to fall apart when November 11 returns and it becomes apparent that Hei and November 11 are looking for the the same girl, who is known as Amber to Hei and February to November 11. Will Hei be able to find her before November 11 does, or will November 11 be taken out before his search can begin? 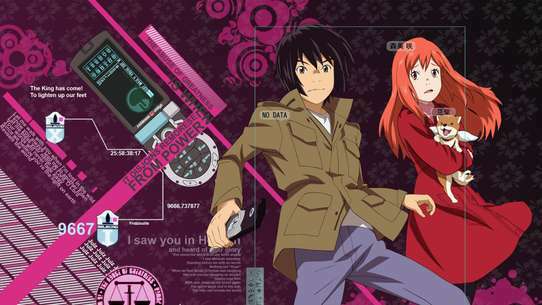 Misaki and Genma meet at the abandoned National Observatory, the former being warned that communications between her and the rest of the world are being tapped by the MIAC. 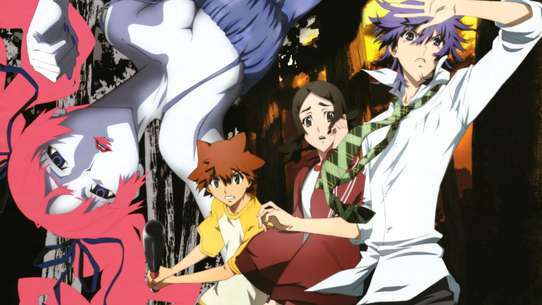 Hei and the others escape from Sapporo under a heavy police lockdown by seeking assistance from the underworld. However, Hei is later duped when their contact gets away with kidnapping July. 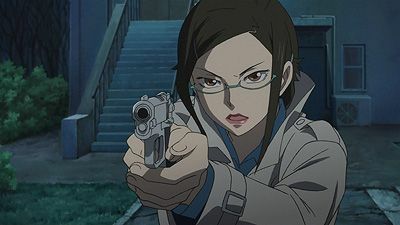 A Russian agent named Ilya Sokolov encounters Suō and uses his Contractor powers to help him detain her, Mao and July after killing their contact. Hei later comes to their rescue and kills Ilya, despite nearly being overpowered by Ilya's powers. The four later were able to arrive at the Sendai Shinkansen station, boarding it while Repnin of the FSB watches them from his cabin. When an explosion is set up to steal a meteor fragment from PANDORA headquarters, Hei is sent it to steal it before anyone else does. On his first day he meets up Corinna Moku, who breaks down not long after arriving at the gate, and Meena Kandaswamy, who is from the same organization as Hei and will be helping him find the fragment. Now Hei must keep from being detected as a Contractor and find the meteor fragment. But will a death at the headquarters break his cover?